Still a bit yellow, I think I need more light. I might try some CF bulbs instead of LED. Make the background all the same, one color or one laminate design. I would go with a one color. Get the contrasts out of the background, then work on lighting to enhance that. Third pic looks nice ! Mark did a spectacular write up a few years ago about his lighting and techniques. Find that (I’m on my phone) it’s invaluable. Reading up on white balance. I can adjust it with my camera. Just need to tinker a bit. If you go with CF bulbs, use bright white. Also try turning off any additional room lighting. Incandescent bulbs, if that's what you have overhead, throw off a yellow glow. It bounces off the walls and right onto what ever your trying to photograph. You have plenty of room to work with, I would consider making up a three panel screen; a back and two sides. A frame can be easily constructed from PVC. The PVC can be slipped together without using adhesive so it can be taken apart or folds up for storage when not in use. 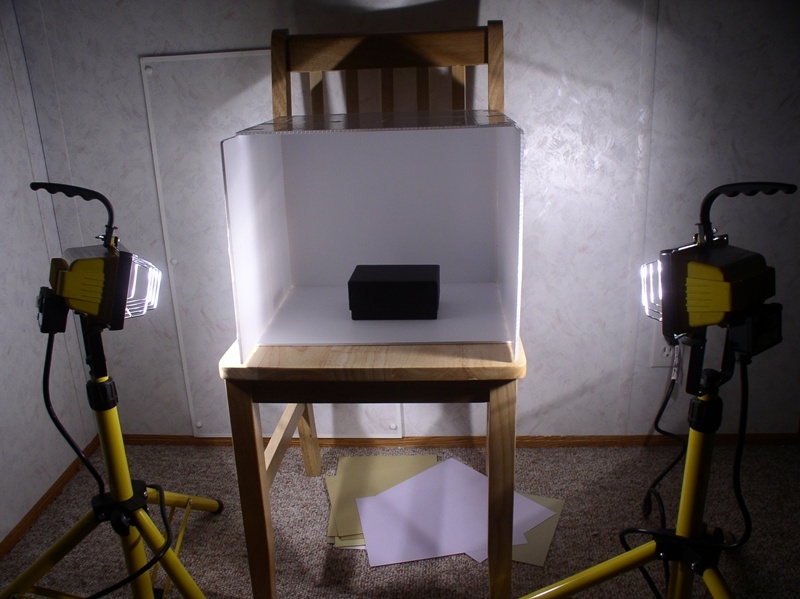 Attach a bright white sheet, squeeze clamps will work, this will reflect your lighting to the subject. The additional light will help eliminate unwanted shadows. Last but not least would be using some photo editing software, lots of free stuff on line. Sometimes you have the shot but lighting isn't just so, one click on "auto color" in a photo editor will usually do the trick. Here's your pic after adjusting the color, literally a two second fix. It took longer for me to type this than it did to adjust the color. The wood grain table top has to go. I used a red bath towel to photograph guns on. Makes a nice contrast. Do you know the color temperature of your lights? Indoor lighting should be 3200* Kelvin. Sunlight should be 5600* Kelvin. Your camera should have those settings or indoor/outdoor settings. My old weathered picnic table has been my backdrop for 12 years and thousands of guns sold on GB. It is like my trademark. I want to try to stay with an old barn wood look if I can. But, if it don't work it don't work. I was also looking into a coarse grain burlap in light pastel colors for a back drop. I just don't like plain white. I will continue to play around and look into lighting and editing. I did put some outlets in the ceiling, so I can have some additional lighting if need be from directly overhead. Thanks for all of the helpful hints. Gave my wife a fancy camera. Told her to enjoy and don’t point it in my direction. Amazing how digital cameras are basically photo editors as well. We all like a "signature," but do you believe it really helps your sales? I have to go with everyone else, and say go with a solid background that is complementary to the subject. Simply, white for dark stuff, and black for light stuff, are good places to start. Wife has an eBay biz selling clothes. She used to try to be "artistic" with the photography, but found those 2 were easiest and showed contrast the best. In your case, because stained wood is almost always a shade of brown with variations into the red spectrum, I'd find something that shows those off, and my guess will still be black or white. As for lighting there's a reason the pros use reflected light, be it off an umbrella flash, bright light reflected off the ceiling, whatever. It minimizes flashback and shadows. The whitest LEDs reflected off of ceiling white paint works well. Right now Costco (if you are near one) has some work LED lights for like $20 each. a couple of those aimed at the ceiling would likely work well, and on the cheap. No photog but frankly I like your outdoor photo. Seen others elect to photograph on overcast days; it seems to work. Here's a photo from a seller on another forum. Always thought his set up and photos were stellar. Be happy to point you in his direction if interested. BTW. The stock in the above photo is sitting in my safe currently wearing an LRB M14 clone build. Color temp settings are important, If you are using household incandescent light, set the 'color temperature' on your camera to 3200K. - you might find you have to go lower to get a good white - 2700k. Daylight is at about 5500K or plus - Mixing color temps from various sources can be interesting, or not! Then the rest is: key to fill ratios, of intensity - hi or low! An aperture of around T5.6 as minimum, and keep light spill off the lens. I suggest you shoot in RAW settings, so post manipulation can be optimal. Use some diffusion on your lights - anything from tracing paper(whiteish) to muslin, a white sheet. keep the light itself far enough away, to light as much of the diffusion, as possible - so it becomes the source, and larger - you could use 1kw multiple quartz lights if you need power for even illumination - they get hot so beware proximity to flammable things. Last edited by Trypcil; September 17, 2018 at 14:48. 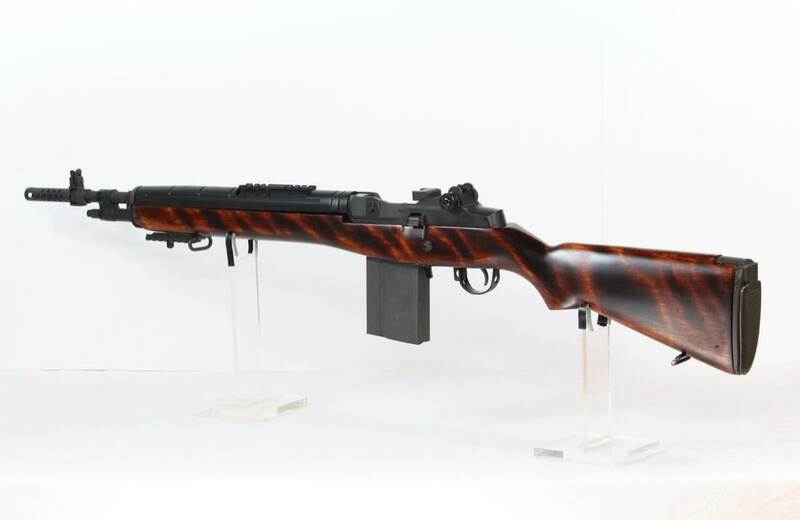 That m1a wood is sweeeeeeeet. OK...Got some new light. They are 6500K compact fluorescent. They did not seem so bright, but this photo was taken at night with the room dark of all other light. No adjustment to the camera from last attempt. I am encouraged. 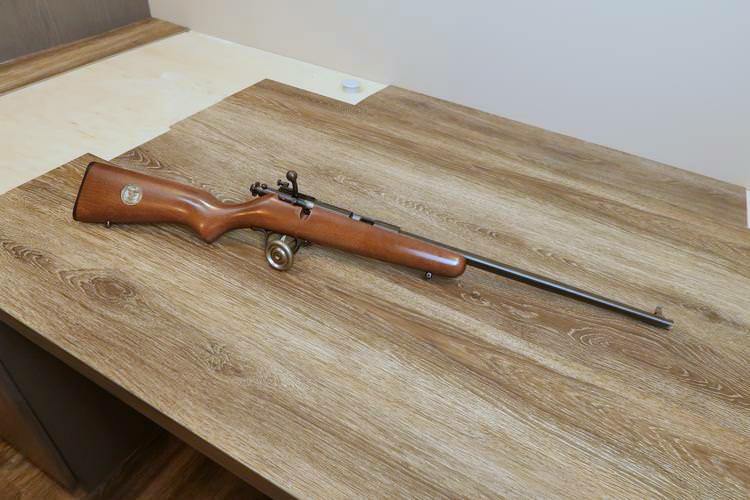 I know you all don't like the wood grain, but I sell 15 guns a week, most with a penny start and a crazy Buy it Now. I am OK with how things are currently selling. I will be moving into the new shop over the course of the next several weeks. I have some "sage" colored coarse grain burlap that I have stapled over plywood, I will be trying that as an alternate back drop soon. The new lighting made a huge difference to the color of wood grain background. It actually looks more grey compared to the first photos which have a yellowish overtone to them. The last picture is much better than the first indoor one you showed. I think the wood is fine. From my perspective it doesn't detract from the overall image. This is going to change my life!! I was out in 50 deg weather with 30 mph wind yesterday photographing for Sundays listings. Didn't really have any trouble with LED vs CFL. But I do manually adjust ISO. Usually need to be different in closeup than in wide (whole rifle) view. The main advantage to me of using white background (roll of butcher paper on ceiling) is that I can cut and paste multiple images onto a single background. The hardest part of white background is having to manually adjust camera settings, as a white background will "lie" to the camera's light meter and the camera will think the subject is much lighter than it is. Result is deep shadowing. Jayson at IGF has been a big help, but I do not intuitively understand photography and some of his tips are over my head. It also looks like he adds shadow in editing when I'm trying to erase it. Last edited by gunplumber; October 21, 2018 at 10:10. The new lighting definitely helps, but I would suggest making the wall background white or hanging a white piece of paper to eliminate the color cast from the wall. 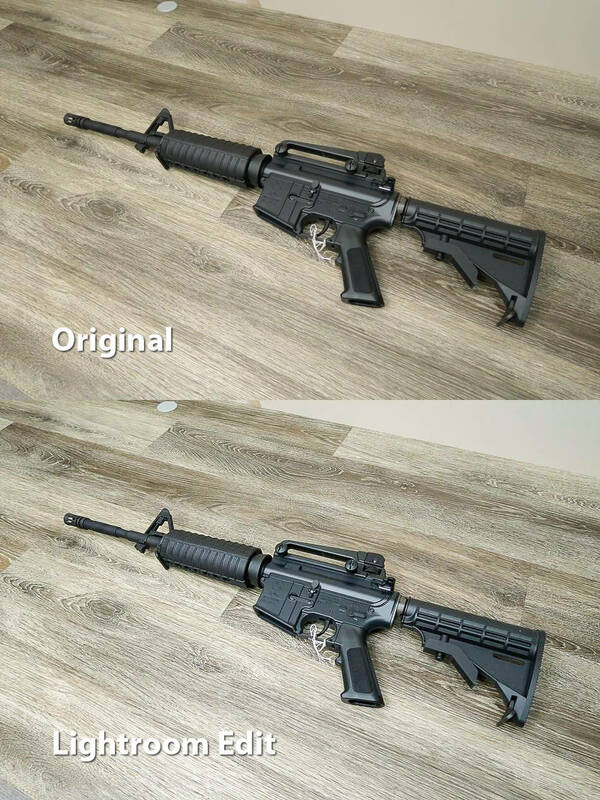 Another option if you don't want to fight camera settings is to use Lightroom or Photoshop (or similar) to remove the color cast and enhance the lighting and contrast. setting on your automatic camera. Some call it a edgeless background. Grey, off white and the like work best for backgrounds for me. light box. I use incandescent and quartz work lights for illumination. I use both for items I sell on Ebay and other online sales sites.